You are here: Home / All Posts / Commuter Slide at Dutch Railway’s Overvecht Station! 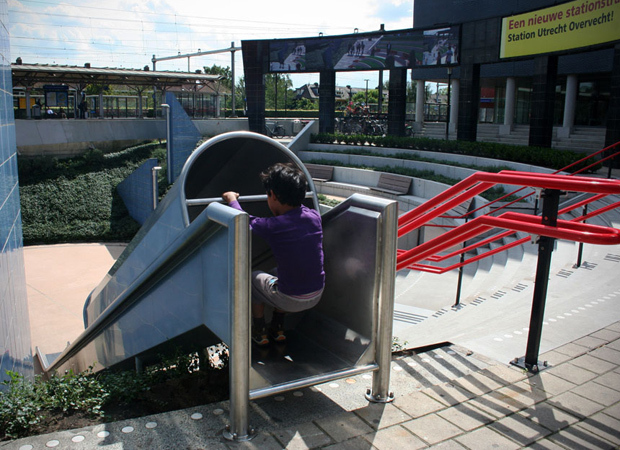 Commuter Slide at Dutch Railway’s Overvecht Station! Odd and quirky. That’s how I define this art installation at Dutch railway station Overvecht Station. It’s a slide. It’s a slide for commuters. It’s a slide for adults. It’s a fun addition to an area that’s so business and professionally oriented. Though it’s weak as “art” it’s makes up for it in spirit. It’s simple and strait to the point. “Would you like to add a little fun to your day?” it says. Or “Care for a smile?” The more I thought about it, the more I wanted more business or “adult” spaces to have little reminders to us all that life doesn’t always have to be so serious. So crazy Dutch Design firm HIK Ontwerpers, Give Us Art! salutes you for giving grown ups some fun too! 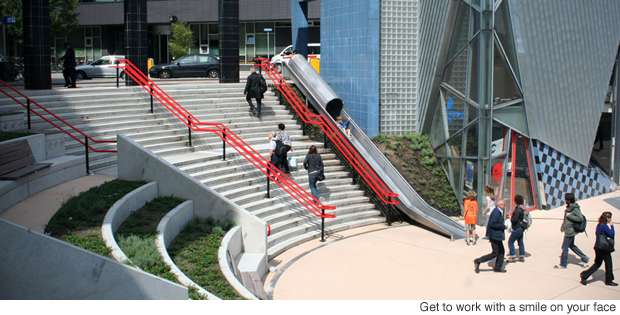 Post inspired by this Huffington Post article- Dutch Railway Station Installs Slide For Busy Passengers. « Larger Than Life! The Sculpture of Katharina-Fritsch!